Throughout the land is an organisation that marches along our high streets in a quasi-military fashion, singing hymns and raising money for good causes. Generally, I have seem the Salvation Army around, and often found myself scratching my head as to why they do what they do, in the manner that they do it, and why they seem to have rights to behave like that which wouldn’t easily be applied to any other organisation. Fortunately, in an imposing building next to Denmark Hill railway station is a museum devoted to the history of the Salvation Army. And it’s open to the public. The Salvation Army was founded in Whitechapel in 1865 by the Rev William Booth who started preaching an evangelical message in outdoors meeting places until they could afford meeting halls. 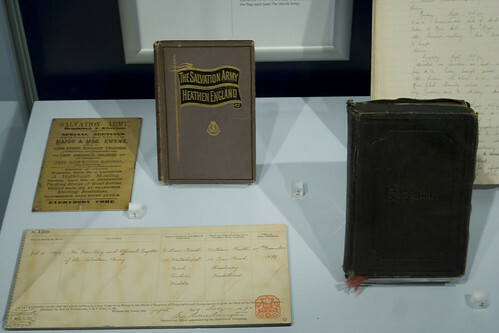 Quite how what was originally the London Christian Mission became the The Salvation Army is however something that despite visiting the museum, and reading up about it, I am still unclear about. I know when, and the event that sparked it — but why did they seek to become the quasi military organisation that they are today? Unfortunately, the museum doesn’t really explain this, and that is a common theme in the museum which details that an event happened, but rarely as to why it happened. For example, in its early days, the Army would hold large public marches, which in turn attracted the attention of opponents, known as the Skeleton Army. Now, that the opponents were made up of publicans and the like, who would have a fairly obvious objection to a group promoting abstinence is easy to guess at. But where did this early desire to march though streets come from in the first place, and how or why were such violent demonstrations against it organised. It was however those marches, and how they were opposed that lead to one of the Army’s more distinctive characteristics — the brass band. 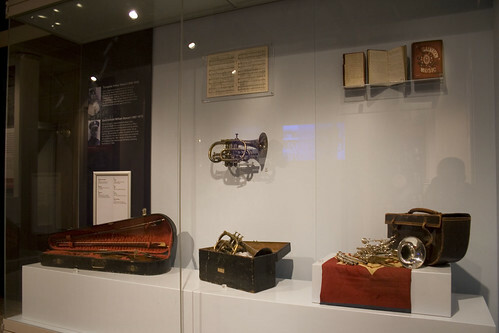 The instruments were chosen for being loud to overcome the din of the opponents, and they have remained a core component of the Army ever since. Of course, marching through town centers on a Saturday morning isn’t all they do, and the Army has expanded overseas into a general Christian aid organisation. You might miss that bit of the museum though, as it is in a separate room. When you get to the drum, look through the open door, and you’ll notice that the museum continues on across the corridor. No signs indicate it, but it is there. 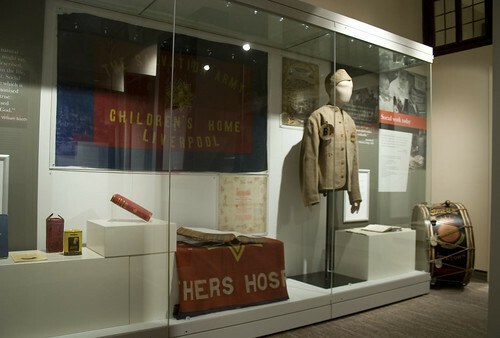 The museum touches on some of the early history, mainly though displays of early books, leaflets and banners. Some basic explanation signs give you a hint as to what you are looking at. However, this seems to be very much a museum aimed at people who are already reasonably familiar with the history of the organisation. Beginners need not visit, unless like me you want to visit anything with the word “museum” in the title! The museum is open Tuesday – Friday 9.30am – 4.00pm and entry is free. 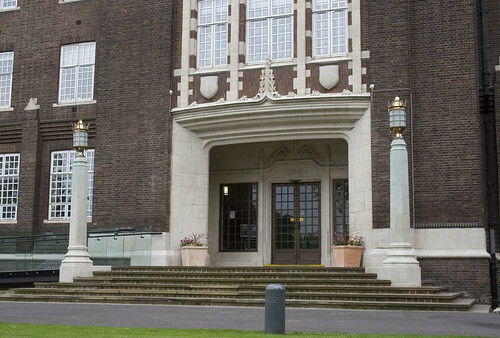 The building [map link], which is the main training centre for the Army and opened in 1929 is pretty impressive though. An atypical fail for the man who designed the phone box and the elegant former hospital in Roehampton (currently being turned into a luxury development with basement gym). It seems oddly-proportioned for its context. Almost an aberration for a man who understood context and proportion in his other public work. An interesting post as always. I take it there was no access to the tower – I popped along for “Open House” a few years ago and there was supposed to be access to the tower, but in the event it was closed. Did the exhibition mention George Orwell and “Down and Out in Paris and London”? The book doesn’t present the Salvation Army in a very good light and I think ends with an admonition to never give money to it. I agree with Roehamster that there is something a bit weird about this one, I knew nothing of the place until I was doing a wander around the southern loop of the Overground, and it suddenly loomed into view and I had to get off the train and investigate. 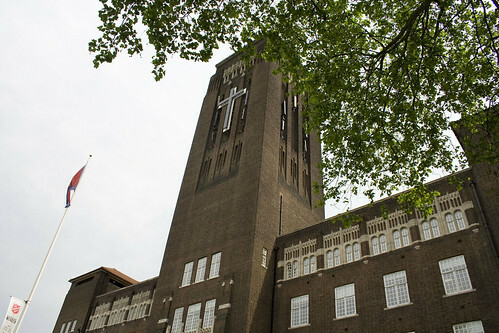 I knew who the architect was with just one look, it’s got echoes of the Cambridge University Library or Bankside Power Station, or stretching it a bit, Liverpool Anglican Cathedral. The bit I find weird is that peculiar stone tracery on the upper floor. What the hell? Plus those pointless turrets at the ends of the wings. I love Giles GS, but if you want to see a real stinker of his, check out the New Bodleian in Oxford, opposite the Sheldonian. Its massing demanded modern brick, but I suspect the client demanded rusticated cotswold stone and squashed classical detail instead!